Deposed Egyptian president Hosni Mubarak was this Saturday morning June 2nd sentenced to life in prison by a court in Egypt for ordering the killing of protesters during the uprising that swept him from power last year. About 840 people died and more than 6,000 others were wounded in the Egyptian uprising, according to Amnesty International. 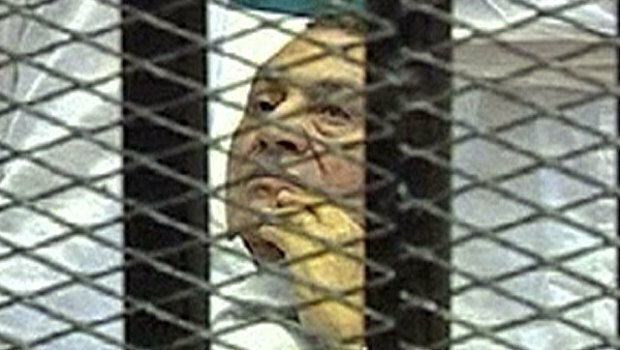 Mubarak's former interior minister, Habib el-Adli, was also sentenced to life in prison on the same charge. 84 year old Mubarak is the first Arab leader to be tried by his own people in the country. See as he keep neck lyk agama lizard! Somtyms i wonder if its dsame God dat created such animals n I. FOR NAIJA HERE OBOI u can do as u lik kill as u lik who wanna hold u is a fresstyle section jarree.. The evil men do no longer live after them, it lives with them now and afterwards. Look at what has just become of a once very powerful personality. Power drunk, see where it leads to? Ghaddafi also ended his life on a tragic note, Charles Taylor also sent behind bars. Warning and signals to the remaining tyrants out there sucking out life from humble and innocent citizens. Last year you publicised a post about the Nigerian Musa couple whose children were snatched by Haringey Council, a local authority in London. On 28th November they were imprisoned and now they are in a criminal court, after having been found guilty in a secret family court. There, the scrutiny is only "on the balance of probabilities", whereas in a criminal court you are found guilty or not - by a jury and "beyond reasonable doubt". We are some 10 supporters in court on a fairly regular basis. But if you could ask your London supporters to click on www.gloriamusa.wordpress.com and lend support or use Email a Prisoner to send messages, I would be most grateful! I can assure you they are innocent. I spent so much time with them that I can vouch for them any time. And I know enough victims of crimes to know how bad institutions are in the UK. Haa! How are the mighty fallen! Too bad! African leaders $ future leaders learn o. The evil dat men do lives afta dem. Will soon happen to GEJ. He should continue deploying army and police to disperse relatively peaceful protests. 84?Wetin remain?The man is almost dead. Sentenced to life imprisonment only???....wtf!! pls assad shuld not be sentencd to life imprisonment, he shuld be hanged o.
hmmmm, a huge fall from grace..
but am sure he'd rather be in jail that end up the way Ghaddafi did. OBJ is next. He shall be disgraced. He has destroyed the entity called Nigeria. You think IBB is bad, oo you need to check the Toad out. The most wicked man in Nigeria and the biggest theif in the history of Nigeria. An old man that God gave the oppourtunity to make things right. Remember when he said Mubarak should not be treated badly. Papa, yours is going to be more like Samuel Doe. he should get...well what can be worse than life in jail(the guy is 70 anyways). Lmfao!! Good for that cow! That should be a lesson 4 our leaders here in Nigeria. Good job 2 Linda. the evil that men do will surely catch up with them. Cop out! He will go and rest in the Sharm el Sheikh while his people think he's in prison. His sons were let off? Jungle justice. The man is almost dead, y cnt dey just tk im 2d Gas chamber straight nao! Hes a waste of space.. Evil that Men DOOOOOOOo lives with them.How wish Men where God,killed innocent People because they Protest for their RIGHT.That is what Goodluck Jonathan is doing right now to the Protestants in Unilag,asking the Police to spray Tear gas on them,because he is the righteous one who knows it better/all.The Masses dont have their Opinions, he whats to use them like Zombi,this is 21st Century he nor go Work .